ClientComm facilitates better communication between clients and case managers to increase the number of people who succeed on community supervision. 4.7 million people are currently on probation or parole, and that number is projected to grow in the coming years as criminal justice reform continues to spread. Across the country, community supervision departments are managing greater numbers of people, with limited resources. Community supervision personnel are tasked with maintaining public safety while helping their large caseloads navigate the terms of their release. It is vital for case managers to have a reliable way to contact each client, and today, people on community supervision are more likely to have a cell phone than a landline, and more likely to read a text than a letter in the mail. 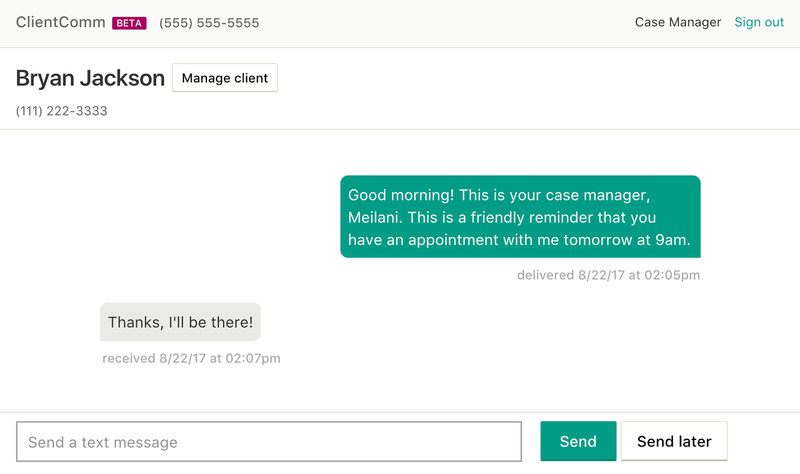 ClientComm lets case managers send clients text messages from their computers or mobile devices. The text messages are sent from one department-wide phone number, and are not attached to individual case managers’ phones. Conversations between manager and client are kept together even if the client changes phone numbers, and can be printed or exported to your case management system. In early 2016, we launched ClientComm with Salt Lake County Criminal Justice Services, which was struggling with individuals cycling in and out of jail due to missed court appearances or court-ordered treatment. 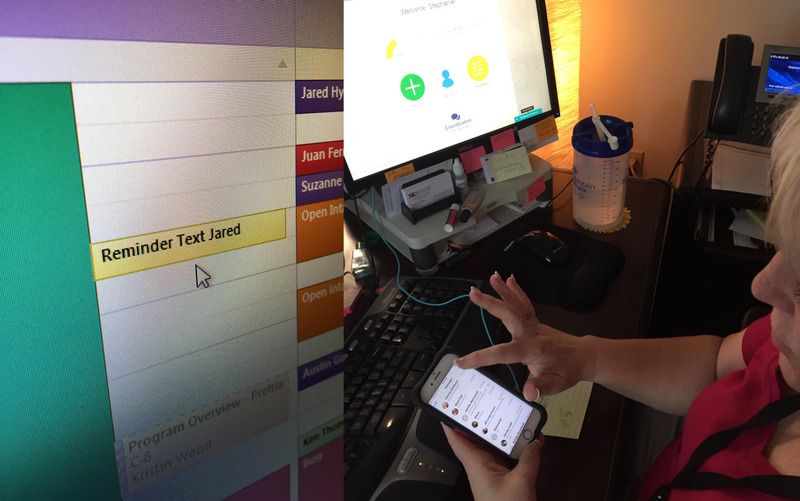 Probation and Pretrial case managers are using ClientComm to text hundreds of their clients on a daily basis. 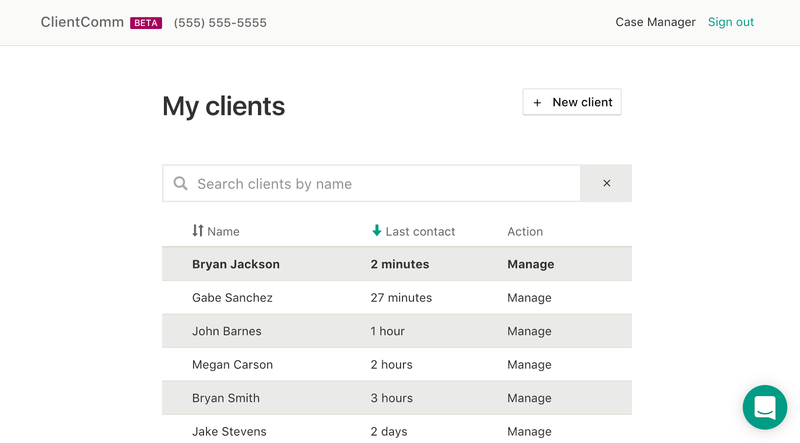 ClientComm allows case managers to cut down on time lost playing phone tag and leaving voicemails. In minutes, case managers can remind, and have their client confirm, that they will be at their next court date, or attend their next treatment class. 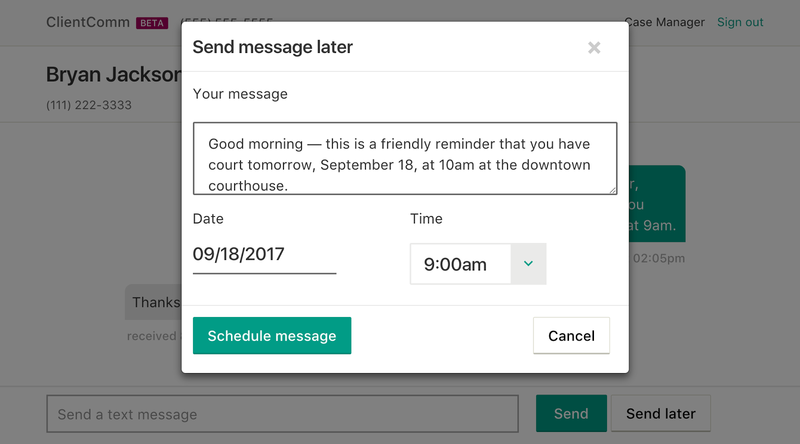 In addition to real-time texting, case managers have the option to schedule messages to be sent at a later date and time. Scheduling reminders 24 hours in advance is particularly popular. Case managers know that these reminders can help clients juggle the many requirements of their supervision, while often dealing with other things like unstable family, housing, transportation, and employment situations. Some of [our clients] have a lot of stuff to get done. It could be really easy to lose track of their obligations. I mean, I’ve got some single moms with five kids! It would so helpful if they could figure out what they need to do. Our internal results in Salt Lake County show lower Failure to Appear rates, and time saved for case managers. We are currently undergoing a Randomized Control Trial on the effectiveness of ClientComm in collaboration with researchers from the University of Virginia. Since launching in 2016, we have expanded our pilot partners to include eight community supervision agencies in Oregon, Utah, Arizona, Iowa, Wisconsin, Maryland, Georgia, and California. Integrating ClientComm into case manager’s workflows is often not solely a design or software development challenge. It’s also critical that we reach out to case managers and work with them, hand in hand, as they onboard clients. With each new jurisdiction, we are looking for partners who can provide input and feedback to inform our product development. We onboard new case managers in-person, and spend time shadowing them to gain a better understanding of their day-to-day in their jurisdiction, in their office. We are actively partnering with new jurisdictions who are interested piloting ClientComm. Contact us to learn more.